The storyline just wasn’t there. This book reminds me of the first steps by a novice writer. There was way too much attention given to long descriptions of things. It made me feel like the author was just trying to fill up space to meet a requisite length. I thought “come on, let’s get on with the story”. I also thought that the ending was week. It sort of reminds me of the weak endings of some of Michael Crichton books or “Dorothy clicking her slippers together “ in Wizard of Oz. The alien of this book could have been used for so much more story. I gave the book 5 stars. 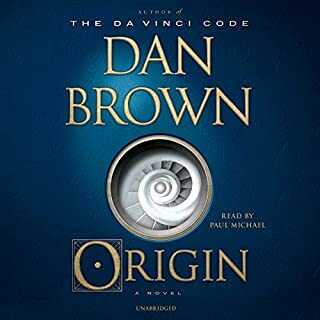 Possibly this is because this is the first book I have listened to of his. Regardless, I found the book engrossing. The story twisted and turned which intriguing. The narrator was very fluid with pronunciation of the various places. Overall I enjoyed it. Star Watch defeated the Swarm Invasion Fleet, but at a terrible cost in destroyed star systems, smashed battleships and billions of dead. In the aftermath of the costly victory, chaos threatens as worlds leave the Commonwealth of Planets, face mass starvation or succumb to increased piracy. The war against the Swarm Imperium has just begun. Humanity needs unity or each planet will fall alone. Brigadier O'Hara of Star Watch Intelligence stumbles onto a secret conspiracy. Someone is trying to destroy the Commonwealth from within, and they have an alien artifact of incredible power. O'Hara summons Captain Maddox. Although she fears to lose him, she knows that Maddox and his crew have the best chance of finding the hidden enemy. If the captain fails, the Commonwealth will be powerless to stop its destruction. Thinking its about time to wrap this series up. The story is getting old. Very repetitious formula. If another comes out I doubt that I will spend the time to listen. If you had just listened to 2-3 of them it is pretty good storyline. 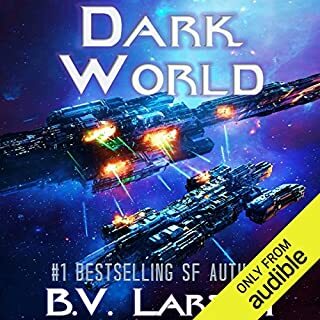 However, I have listened to the entire series and ready to move on to something else with different characters and a different storyline formula. They came from the brightest star in the southern constellation of Carina. First they studied us. Now they're among us, threatening human existence as they search for the Starcore, the greatest device of the lost Polarions. Logan is captured in the Nevada desert but escapes in Greenland. There he finds an extraterrestrial stealth ship, giving him the means to take the battle to the enemy. I found the over all story and action something akin to a junior high or high school level sci-fi book. The hero goes from one major threatening disaster to another (way too many) and then suddenly and miraculously finding some way out. Way too many situations like this. It really started getting monotonous and nauseous. As for the story, giving it 3 stars is being generous. Actually after thinking about this I am going to go back and change it to 2 stars. The narrator was good as always. Good range of voice altho this book didn’t stretch his abilities since so few characters. Overall, I give this book 3 stars. If there is a sequel, I certainly hope the author adds much more depth to the story and characters and “grows up” both. If not, I will quit the story and go read something with more depth. 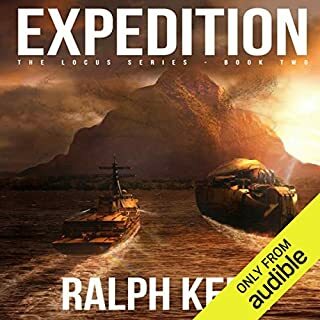 Expedition, the explosive second novel in the Locus series. The sins of the distant past echo far into the future. An uneasy peace settles over the strange new world into which the M/S Atlantica has been thrust by the Locus. 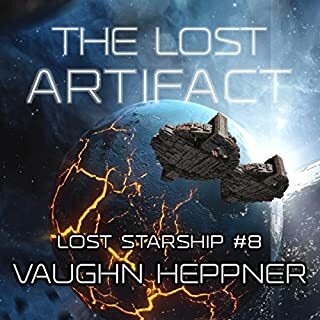 The cruise ship leads her war-weary fleet on its first, tentative steps beyond simple survival. 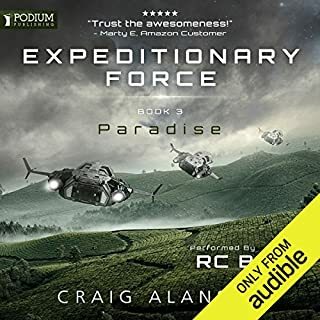 But an expedition to the mainland changes everything, sparking a chain of events leading to a devastating new conflict. This 2nd book is better. The story is stronger and the intrigue is building. 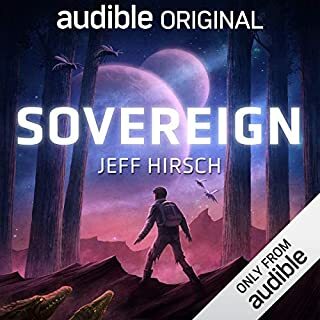 The narration is just ok. A stronger narrator would probably lead to an improvement... one with wider vocal range and stronger emotional projection. Regardless, ok but book is better than first. After almost ditching the series after the first book, I am glad I hung in there. Now looking forward to 3rd in series. Thumbs up. Reminds me of the movie Final Countdown. Anyway, mildly entertaining. The narrator did not have a very imaginative and wide range of voices for the characters. As a result, I found it was more than average difficulty remembering who the was and with what group. Character development was lacking which added to that difficulty. Anyway, was torn whether I was willing to listen to next book in series. Finally decided I would give the series another chance hoping it will have its sea legs. The character voices add some additional "flavor" to the story yet the printed version also has some strenghts. I have enjoyed both. The audio however, allows me to listen for my 70 minute drive back and forth to work. 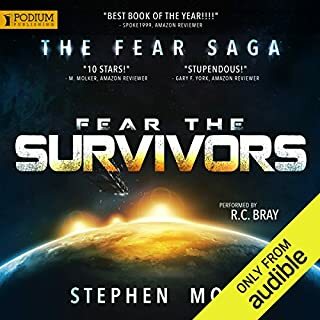 What other book might you compare Fear the Survivors to and why? hmmm. Hard to say. This story is a refreshing topic and approach which is why I like it. To me it is different. A clock is ticking yet the detail is there as to how mankind gets ready for it. Reminds me some of the John Ringo stories. Yes and this one is right up there. His voice characterizations are not overly done yet enough of a difference you can tell who the character is. Excited that ii was different than the run of the mill Earth in danger stories. Excellent book and highly recommend because it is different. R C Bray never disappoints. I highly recommend this book to any of my friends. Great stroyline, characters and hilariously funny. There are parts where I laughed so hard tears ran down my cheeks. Fantastic all around good book. Skippy by far is my favorite character with of course Col. Joe right behind. The back and forth banter is hilarious. There inter-relationship has continued to grow thoughout these books. Bray is excellent. His character voices make the book and add tremendously to the comedy. By far and away, my favorite spot is when the enemy was going to take the 3 ships and have fun hunting and killing the humans. Skippy proceeds to manipulate the &quot;accidental&quot; destruction of the 3 ships and the entire base. Skippy's narrative of the on-going events were absolutely hilarious. This is no doubt my favorite moment of all 3 books. This is the point where I am laughing so hard driving, that I had to pull onto the shoulder with tears running down my cheeks. I went back and replayed the scene 3 times. This series has been great and I can't wait until the 4th book comes out. Action plus plenty of comedy. Absolutely time well spent. Good story line although this book was not quite up to the 1st book. Still getting lots of laughs from Skippy. 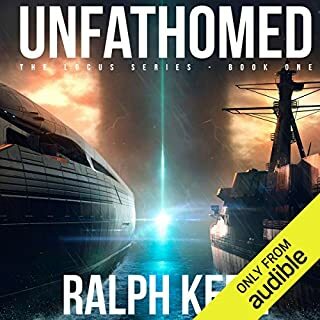 Superb.He captures to different voices very good and he puts the intonation in the voices to maje it enjoyable and easy to visualize the characters. 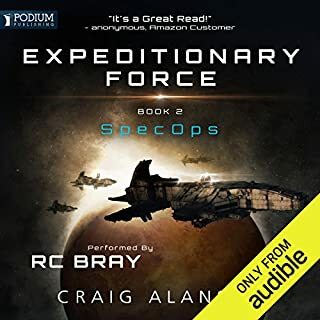 Could you see SpecOps being made into a movie or a TV series? Who should the stars be? Yes I could although Hollywood would prabably screw it up. Of course the stars would be Col. Joe and Skippy. Great thought would have to be given into the appearance of Skippy. Can't be too sophisticated yet not so campy it looks corny. The other characters would be steady supporting cast. Show would have to hve believable action and suspense yet have those few special moments of hilarious comic relief. Would be a hard balance to strike. 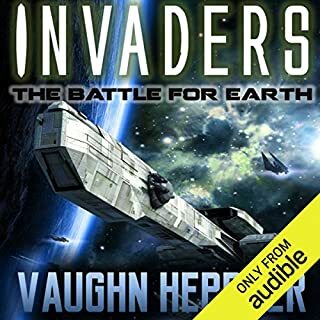 I have never read any SciFi book or non-scifi book that has given me so many laughs. I listen to these books driving back and forth from my office (75 min. one way). I have actually had to pull over because I was laughing so hard my ribs hurt and tears were streaming down my cheek.As I write this review I have already listend to 3/4 of the 3rd book which is even better. Alanson has great imaginiation and creativity. Very wll don by he and Bray. Great combo.